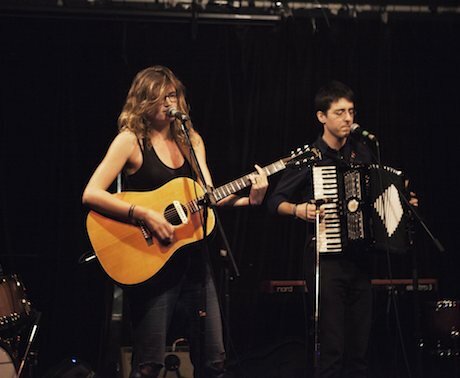 Toronto-based singer/songwriter Charlotte Cornfield brought a great vibe to the growing crowd at Montreal's Il Motore. Armed with an acoustic guitar and a great voice, Cornfield and her backing band chugged through a set filled with fun folk accented by upright bass and accordion for a unique sound. The drumless love ballad "Big Volcano, Small Town" was playful, rhyming "inukshuks" with "cookbooks" for the night's most unique rhyme. Halfway through the set, Cornfield introduced rising Montreal folkie Leif Vollebekk to join them on guitar, adding some fun accents to the last half of the set. Set closer "If You Don't Pursue" saw a different lineup: Montreal's Chesley Walsh came onstage to add some backing vocals, and Cornfield took a turn behind the drum kit, her jazz percussion training definitely showing. The song's breakdown, completed by a beautiful three-part harmony singing "lover man, why you gotta be like that," provided an excellent end to the set.